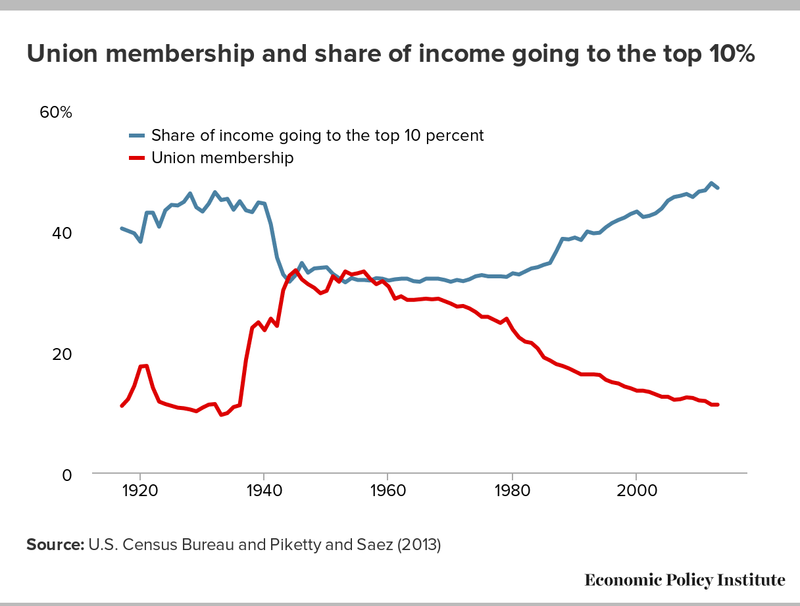 A pattern that Colin Gordon has presented in past years (2013, 2012) is that union membership density fell as the share of income going to the top 10 percent escalated. We update his chart using new data from Piketty and Saez’s analysis of tax data. Union membership remained at 11.2 percent in 2013, though we already know that it dropped to 11.1 percent in 2014 (not shown in the figure). The share of income going to the top 10 percent hit 47.8 percent in 2012, the highest it has been since 1917 (the earliest year available in Piketty and Saez’s data). In 2013, we did see a slight drop in this share to 47.0 percent. As we noted when we reported on a similar decline in the top 1 percent’s wages in 2013, the increase in the top marginal tax rate in 2013 might have led to some shifting of income from 2013 into 2012. If this were the case, we would likely see the top 10 percent’s share of income to continue its longer-term upward trend in 2014. We also note that top 10 percent income shares in 2013 were higher than those in 2011 and represent a significant increase from the 45.5 percent share in 2009 at the start of the recovery. Data on union density follows the composite series found in Historical Statistics of the United States; updated to 2012 from unionstats.com. Income inequality (share of income to top 10%) from Piketty and Saez, “Income Inequality in the United States, 1913-1998, Quarterly Journal of Economics, 118(1), 2003, 1-39. Updated data for this series and other countries, is available at the Top Income Database. Updated September 2013.